After my review last summer of Bike Gallery, it seems as though the staff either read the review or read my mind, or both. And I know this because I’ve been in a couple of times since my original review, and they’ve earned my business back. What got me to go back in the first place after feeling slighted for my less-than-$10,000 bicycle? 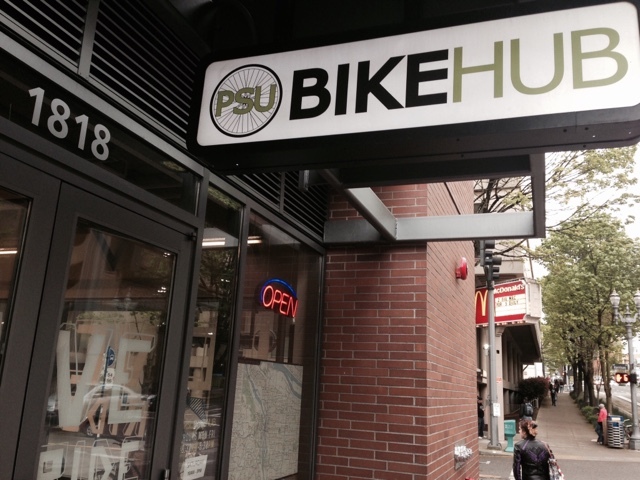 Well, it was the shortcomings of PSU Bike Hub. Not that I wholly can blame Bike Hub, as it is a different sort of operation. Here is my honest review of PSU Bike Hub. What Is Bike Hub About? The shop is across the street from Portland State University (PSU) campus and is a service of the university, staffed primarily by students. They offer paid annual memberships to PSU students and staff that get you discounted merch prices, perks like free U-lock rentals, and term rates on bicycle rentals and access to on-campus bicycle garages. The main perk (in my view) is the free use of the space and tools (plus some staff assistance) to learn your own bicycle repairs. This is a huge perk for students who don’t have space/ funds to build a tool set and want experience. It’s also great for anyone who may not carry tools with them and finds herself in need while downtown or on campus. Check out what Bike Hub did for Gem! 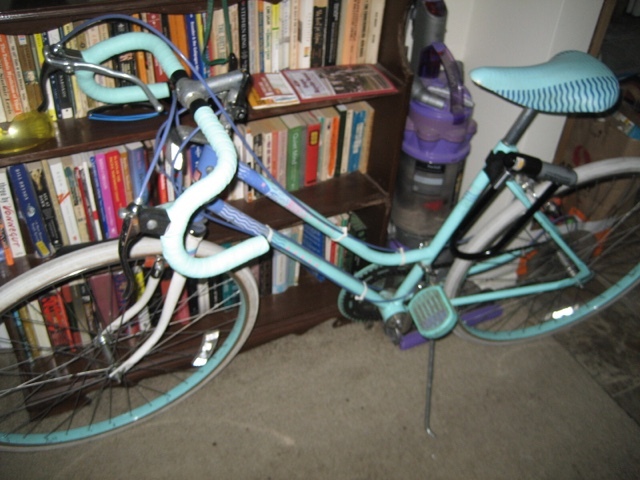 (This bicycle is for sale now by the way, including a breakaway front basket.) It was done same-day and at less than 1/2 the cost that Bike Gallery was trying to charge. Because of the savings, I got the new tape on the handlebars, too! Weeks and months later, they were helpful throughout the process of breaking in Rainbow Bright and helping my bf & I fix our minor issues ourselves with the use of their tools. However, there are times when they have either said a job could not be done at all or they could not help me do it with their tools. Specific Example: Recently, I got 2 sets of new pedals at a steep discount at the now-closed Bike Commuter in Sellwood. (RB had the same scrapey pedals as Green Lantern, for those who followed the saga.) Bike Hub employees flat told me it could not be done, and that the pedals were the wrong size. While I was working on another issue (brakes or something), I asked what tool to use to try it out, and he went away with both sets of the pedals for a minute, came back, and informed me that Yeah, these are incompatible with my Peugeot. Slightly miffed, I of course kept the pedals, but rode away on the old scrapes. When one of those scrapey pedals on RB snapped clean off, I knew it was finally time to stop procrastinating and put new ones on. Since selection at Bike Hub is super limited, I thought I would just browse Bike Gallery… And I figured too that it might just be worth it to see if they could put on either pair of the pedals I had. Worst that could happen was they couldn’t. Ten minutes and a reasonable install fee of $6 later, it was done. 8a.m. to 6p.m. is pretty good, but I’d like to see a little later (maybe 8p.m.). They are completely closed on Sundays, another reason I was shunted to Bike Gallery. Bike Hub is not, and does not pretend to be, a full-service bicycle shop. A good bet is to buy the parts you need elsewhere (ex, City Bikes) and save some labor cost if you have the time by using Bike Hub tools. The membership makes it a good value, but everything is new and high-end. Selection is also quite limited. Thus besides membership pricing, there are rarely “good deals” to be found. However, labor is not expensive, and they are super friendly. Excellent resource/ student perk. 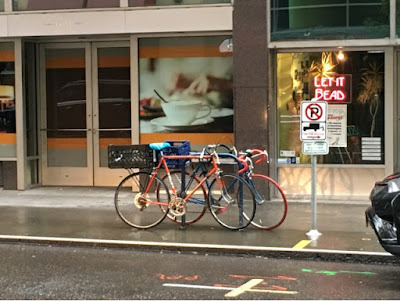 I recommend it to everyone in the University community, as it has classes and is really more of a “bicycle learning experience”; though unlike other bicycle learning experience shops in Portland, Bike Hub does not do a whole lot to foster a sense of community.